For people dealing with blemishes, Terrai Acne Cleanser plays an important part in anti-acne skincare routine. Its hypo-allergenic formulation, made by blending Natural Extracts of Neem & Brahmi in a Clay (Multani Mitti) Base, works well on oily as well as acne prone skin. Glycerin, another key ingredient used in our formulation, has superior rinsing qualities. It cuts through the oil and rinses completely. 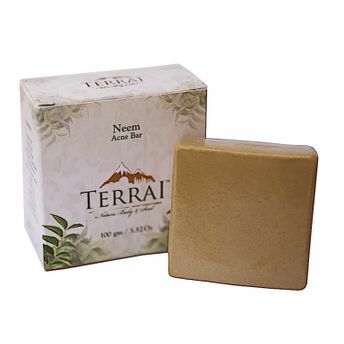 The clay base helps absorb the oil and dirt particles accumulated on the skin while Neem & Brahmi extracts ensure the skin remains clean and free of impurities. It is mild on the skin and does not clog pores, ensuring a healthy skin. Contains no harsh additives, dyes or hardening agents. Explore the entire range of Soaps available on Nykaa. Shop more Terrai products here.You can browse through the complete world of Terrai Soaps .